This is a recipe my husband came up with several years ago and we still enjoy it at least weekly. A combination of bacon, potatoes, onions, sweet peppers, jalapenos (if you desire), and ham (opt. 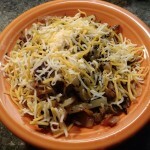 ), topped with shredded cheese. Yum! Of course, any of these ingredients can be changed or deleted to your liking. Cut up bacon by slicing across the slices into 1/4" or so pieces. Cook in skillet until just done. Add remaining ingredients except cheese. Cook, stirring every 5-10 minutes, until done. 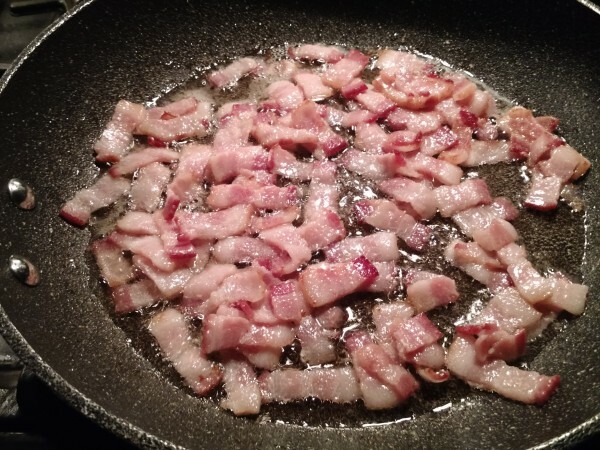 You may need to add a little butter or oil to the pan, depending on the skillet you are using and the fat content in the bacon. Serve topped with cheese of your choice! Cilantro or green onion makes a nice garnish for this dish. You may also want to add salsa to the top. We always buy jalapenos and sweet peppers by the bushel or half bushel at the farmer's market in the fall, then we dice them and freeze them in quart Ziploc bags, so they are always ready to go whenever we need them! The potatoes are julienned using a nifty device called Nice Dicer. We have an old style one, that we have been using for years. It works great and saves a LOT of time! To save some time on a weekday morning, cook up the bacon the night before and save in a covered container with the other veggies, all chopped and ready to throw in the pan the next morning!